Use bright containers overflowing with attractive flowers to line decks, patios, walk ways or indoors. Nearly any flower you grow in garden beds can be grown in containers. Planting instructions vary by flower type and aren't much different than outdoor planting recommendations. There are several specifics that apply to nearly any container garden that will make your pots a success. Use large containers, smaller pots, hanging baskets or window boxes for your live arrangements. Choose the container for your flowers. On average, choose a container that is a third as wide as your flowers' maximum height. Err on the side of larger rather than smaller. Ensure the container has plenty of drainage holes or add a 2- to 3-inch layer of gravel in the container bottom so the roots won't drown in a waterlogged pot. Use purchased potting soil—either general purpose soil or a soil mixture tailored to your variety of flower. Make your own potting soil with 1 part loam, 1 part perlite and 1 part compost. Substitute peat moss for the compost or mix the two together for their portion of the soil. Plant the flowers in the container. Follow planting depth and spacing instructions on the care tag for the specific flower variety. Avoid over-planting your container, as this will choke the roots and dry the soil too quickly. Keep the soil moist. Containers dry out faster than bed plantings. Water in the mornings, taking care to keep the plant foliage dry unless otherwise instructed on the care tag. Water until the water begins to drain from the container holes. Fertilize once monthly or as recommended on the care tag with a general purpose fertilizer. 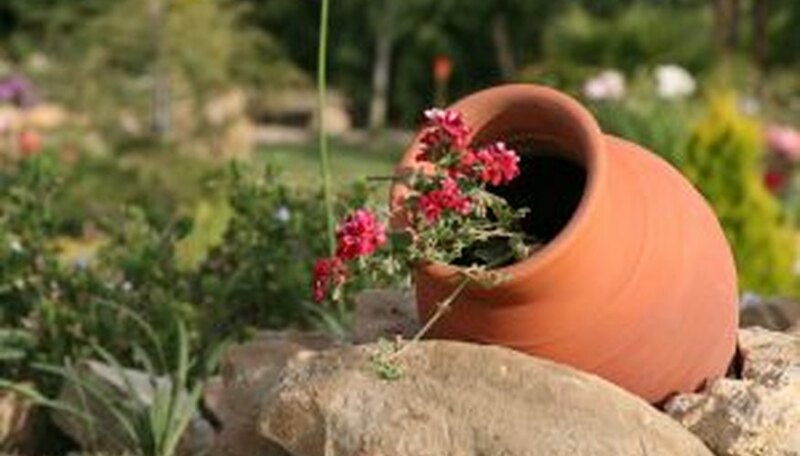 Soil nutrients in containers are quickly used up or drained out with waterings. During the growing period, fertilizer is a necessity for healthy plants. Apply a timed release fertilizer to the soil if you wish to avoid frequent fertilizations. Transplant into larger containers if roots begin showing through the drainage holes. Place clay shards over large drainage holes to keep the soil from running out. Avoid watering in the evenings as this leads to mold and fungal growth.